The large, pretty waves that rocked Chicago's lakefront on Friday also did some pretty ugly damage to one of its crown jewels -- the bike path. 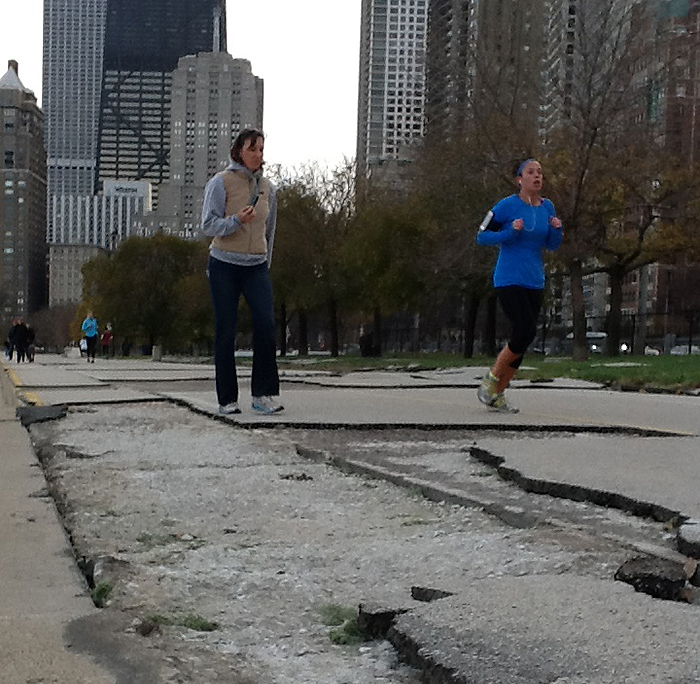 Cyclists, runners and walkers negotiated some rough terrain on the busy lakefront path from Fullerton Avenue to Oak Street Beach this weekend. Some of the heaviest damage was at Oak Street Beach, one of the busiest sections of the path. Several large chunks of concrete were scattered over the path, making for dangerous conditions for "pathletes" who work out along the path. Several joggers stopped to take photos with their smartphones on Sunday afternoon. During a 20-minute photo shoot, two runners stumbled and several cyclists struggled to get through the rough patches. High waves and flooding on Friday shut down parts of the path and Lake Shore Drive. The city said workers will begin repairs on Monday. View this photo album of the damage and tweet any photos of other bike path damage to @redlineproject. We'll post it and credit you.